Pewter tankards have been around for centuries, and tankards are certainly one of the most common items made with pewter. Tankards are cylindrical and are usually bigger at the bottom. Another way to describe it is as a hollow cone with the top cut off around half way up! 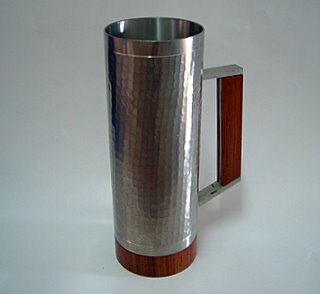 A tankard has only one handle, and sometimes comes with a hinged lid. Historically, the lid serves to prevent insects or debris from getting into the drink, especially outdoors. A thumb lever located above the handle allows the lid to be opened easily by the same hand holding the tankard. The cute little tankard above is an English piece I found at a flea market. It has a set of three touchmarks at the bottom, but I'm afraid my camera does not have enough resolution to take a sharp picture of them so I can't put it up here. Anyway, one of the marks is the triangle ABPC mark which refers to the Association of British Pewter Craftsmen. In the middle is the seahorse mark commonly seen on British pewter and this is the mark of The Worshipful Company of Pewterers, a guild formed many centuries ago to police the pewter industry in England. The seahorse signifies good quality. There is another touchmark belonging to the manufacturer or trader, and on this one are the letters 'I&BW G'. I managed to find out that this mark belongs to I. Gibson & Son Ltd., a Sheffield-based company which had apparently gone out of business in 2002. 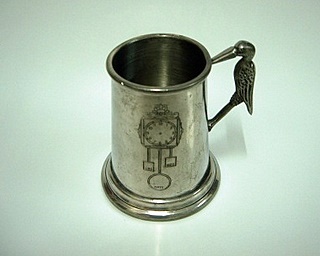 I have two pewter tankards like the one pictured above. This one is completely cylindrical, fitted with a wooden bottom and handle. The surface has a hammered finish. It's a little too tall for my liking, measuring at about 18cm. I also found the cousin of this one, which did not have a hammered finish. I definitely prefer it hammered! Old tankards often come with a glass bottom. An interesting story has it that if a drinker saw a coin at the bottom of the mug, he could refuse the drink and therefore avoid being conscripted into the British army or Royal Navy. This was during the 18th and 19th centuries and anyone who took the King's shilling would be forced to serve as a soldier or a sailor. I've seen a couple of these glass bottom pewter mugs before but didn't end up buying them because their conditions were too poor. But eventually I did find one in a pretty decent condition. You can take a look at my antique Swatow pewter tankard with glass bottom. A relative of the tankard is the beer stein (yes, it's German). This mug is usually bigger than a tankard and could be made from glass, porcelain, wood, silver, and of course, pewter. In Munich they are also called 'Keferloher', after the place from which the clay was once used to make the Oktoberfest mugs.